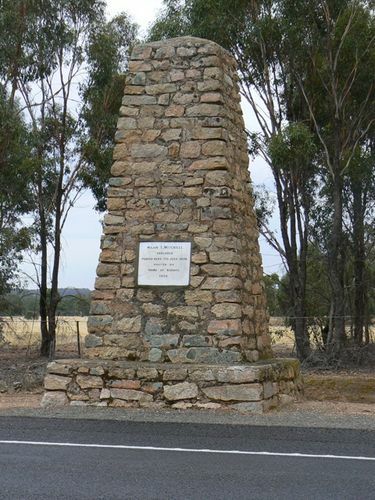 A monument erected by the Shire of Korong commemorates Major Mitchell's expedition which passed through the area in 1836. 36 cairns or tablets to Mitchell were erected. The goal of Mitchell's third expedition was to explore and survey the lower part of the Darling River, with instructions to head up the Murray River and return to Sydney via the settled areas around Yass. Second in command was assistant surveyor Granville Stapylton, and 23 convicts made up the rest of the party. He set out on 17 March 1836, and when passing Bathurst engaged a Wiradjuri aboriginal guide, John Piper. Mitchell made his way to Boree and the Bogan River as on previous journeys, then veered south to the Lachlan River to approach the Darling from its southern end where it joined the Murray. At the end of June the country had improved considerably, so Mitchell chose to leave the Murray to investigate better looking lands to the south-west. Upon climbing the 300 foot Pyramid Hill, he was so impressed with the country he saw, he named it Australia Felix. In early July the party crossed the Loddon River, and made their way in a south-westerly direction which brought them to the Grampians, and later to the mouth of the Glenelg River on the coast. Passed Here 7th July 1836.